There is an internal spat going on at our beloved British Broadcasting Corporation over advertising. A smug bunch of deputy-assistant tv producers, sound engineers, production assistants and the odd artistic director have teamed up to start a “No Ads Campaign” in opposition to moves by the BBC Board to allow their international services to run adverts for the first time. We can safely ignore the arguments of the anti-capitalist campaigners whose own ideological hang-ups and vested interest mean they would never countenance any funding for the Corporation other than the compulsory licence fee. But the most interesting angle comes from the management themselves. 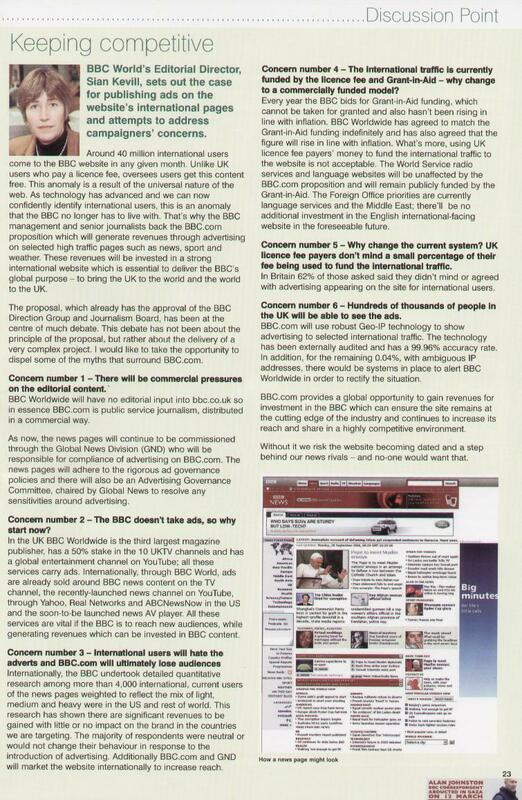 In the June edition of the BBC’s in-house magazine (very glossy and judging by the piles on display, of barely any interest to the staff), Sian Kevill, BBC World’s Editorial Director, has a full page to answer the campaigners and put forward the view that publishing ads would be a good thing. What follows, is an attempt to assuage the concerns of the campaigners (“There will be commercial pressures on editorial content” / “Why change the current system when it works so well” / “A commercially funded model will erode the BBC brand” etc.). However, in doing so, Ms Kevill essentially makes all the necessary arguments for allowing advertising within domestic BBC services and therefore, by implication, argues against the licence fee. If this is achievable for BBC.com, a simple editorial division would prevent commercial pressures influencing UK content in a setup that was funded by advertising – like all other national news agencies – and not the BBC licence fee, which has all the essential characteristics of a poll tax. In other words, international BBC services have been competing with other broadcasters and news agencies in developing markets by running adverts already. This is crucial to keeping the BBC at the forefront and ensures that new audiences can be reached. The adverts also provide extra investment to invest back into quality programming that would suffer if we just had to rely on a gradually eroding share of a central subsidy. So far from turning people off, the BBC management now admit that it helps attract new audiences. If that applies in Africa, then it should apply in the UK as well. And just to reiterate the point, Ms Kevill describes the lengths they have gone to consult the world’s viewing masses about what they think about adverts on the BBC. God knows how much that cost. Perhaps they could repeat the exercise in the UK, unless they thought they wouldn’t get a supportive response (“I love the opportunity to pop out during a period drama to make a cupper and if it saves me £120 a year then hell yes – give me adverts!”). If this is an argument in favour of adverts that doesn’t apply in Britain, it must only be because the BBC management think that the brand is so universally respected that any advertising would erode it in the eyes of the British public and so couldn’t be allowed (unlike premeditated attempts to misrepresent our Head of State in a documentary and dodgy habits of conning 8-year-olds on Blue Peter phone-ins…). The BBC is no longer the revered institution it once was – here or overseas - and their own polling shows that people don’t care if they run adverts, so drop the pretence that this doesn’t apply in the UK. We couldn’t agree more. For the same reasons using a poll tax to collect a guaranteed source of revenue from every television viewer whether they watch the BBC or not is just as unfair and it shouldn’t matter where they live. If I don’t choose to watch the BBC, it is not acceptable that I am forced to pay for it – whether I’m watching tv in Cairo or Corby. The licence fee is essentially a subsidy from people who don’t watch the BBC in Britain, to people who do watch it (in Britain or elsewhere). Bring on the advertising (and subscriptions), and then we can all only pay for the services we use (as millions do already on top of the licence fee by paying for Sky or cable). Presumably, the anti-ad campaigners in the BBC would prefer an international BBC licence fee, levied on all tv viewers in the whole world, so no advertising would ever be necessary (because all advertising is evil - according to the sociology textbook they read in 1977). Or perhaps this would be too much of a burden on the poor in the Third World and so they'd like universal penetration with the BBC in every Chinese apartment, African shanty town and Brazilian slum, so long as the licence fee increased every year in the UK to pay for it. £250 a year anyone? That’s right. Us poor licence fee-paying trolls on our small island cannot be subjected to advertising on the BBC under any circumstances, and the management can give firm assurances that expensive technology and safeguards will be in place to guarantee this disgrace will never occur, or if it does, we will have devices (alarm bells, sirens?) to “alert” us. All this means that the BBC management is pursuing – under force of financial necessity and market reality – a commercial funding model for the BBC, but only outside of this country, while actively seeking support for this by guaranteeing to its own staff and other vested interests that no such benefits will be applied to the millions of UK licence fee payers, less that raise questions over the funding settlement guaranteed by their annual £3 billion subsidy. And furthermore, we will invest in cutting-edge internet safeguards to keep it this way - a BBC v-chip by any other name. So there we have it. We have to remain stuck in a country with a 1950s-sytle national broadcaster and a collectivist funding model because without it the whole cosy monopoly of the BBC would be exposed, but if you’re watching the BBC news from a hotel room in Cape Town, then the BBC treats you as a intelligent consumer who can handle a few adverts for Lynx aftershave. Adverts abroad are not just an inevitable development – they are a good thing that the BBC should embrace. Adverts on BBC content in Britain – now that would be a shameful catastrophe. In one sense of course, they are right. It would be a catastrophe – for them. Adverts on the BBC would fatally undermine the case of the licence fee and the privileged position that the BBC holds. If you were Ms Kevill or any of the other BBC directors on six-figure salaries, what would you say? Faced with an internal rebellion of hard-core BBC campaigners it is no surprise that the BBC has once again fudged the issue. Arguing for its own interest and shamelessly applying one rule for British taxpayers who fund them, and another for everyone else. If this is what they really believe, perhaps they should all come clean and make this argument in public, rather than burying it on p.23 of an internal staff magazine. That would at least treat us - the British taxpayers - as the valued audience they keep saying we are.